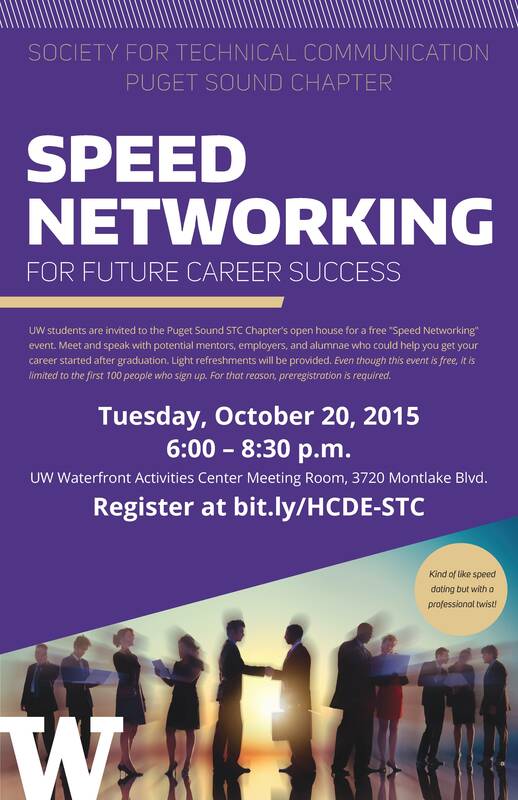 The Puget Sound Chapter of the Society for Technical Communication (STC) is hosting a “speed networking” session at the University of Washington at 6pm on Tuesday, October 20th. I’m delighted to say that I’ll be there too. In addition, you’re invited to an API Technical Writing Workshop that I’m running in conjunction with the STC on Friday, October 23rd. It’s open to students as well as people already in the tech writing field. See the details here. I like the spelling of “alumnae”. At first I thought, “Gah, typo!” Then I realised it’s a thing. The purple colour is awesome. It matches my Ubuntu background! I hope to meet many students and other Seattle tech comm folks at the networking event and at the workshop! Posted on 30 September 2015, in APIs, STC, technical writing, workshops and tagged networking event, speed networking, Technical Writing Workshop, University of Washington. Bookmark the permalink. 1 Comment. Might the API Writing Workshop Tour reach Chicago?